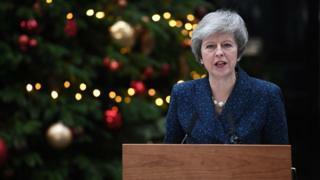 Theresa May survived a vote of no confidence on Wednesday evening. Many of her MPs publicly said during the day which way they planned to vote ahead of the poll. The ballot was secret, so an MP's public declaration might not match up to the mark they made on the ballot paper. We now know that 200 Tory MPs backed her leadership, while 117 voted against. The figures below reflect how they said they would vote before the ballot. I fully support the PM. This is a crucial stage with weeks to go before we leave the EU. We need to back @theresa_may and deliver the referendum result. The PM is working in our national interest and this distraction risks damaging uncertainty. People in the #NorthernPowerhouse back @theresa_may and so do I. 100% behind the PM. Will be supporting PM Theresa May in the vote tonight. The country will not understand how elements in the Conservative Party can seek a divisive leadership contest at this time. PMs sense of respect for both sides of Referendum debate deserves support. I am giving my full support to @theresa_may who has always put the national interest first. We need to honour the outcome of the referendum and support the PM to deliver Brexit on 29 March 2019. I shall be supporting the Prime Minister this evening. This is no time for the self indulgent spasm of a leadership election. Nothing fundamental will be altered by it. This is a time to show loyalty and discipline in supporting the PM in discharging the duties of government. Just about to appear on @BBCr4today. Theresa May will have my full support. Removing her would be self indulgent and irresponsible. I am backing the Prime Minister 100% - and I urge every Conservative MP to do the same. She is battling hard for our country and no one is better placed to ensure we deliver on the British people’s decision to leave the EU. The country is divided. Parliament is in deadlock. That was the case yesterday, and is still the case today - this flows directly from the fact that we have a hung parliament. Changing leader will not address this real and pressing issue with Brexit - this should be our focus. Vital to support @theresa_may today. She is working hard in the interest of the U.K. to get a good Brexit deal and she has my full support. Now is not the time to change leader. I shall be supporting the PM wholeheartedly. The PM has my full support. At this critical time we need to support and work with the PM to deliver on leaving the EU, & our domestic agenda - ambitious for improvements to people’s lives & to build on growth of wages & jobs. I fully support the Prime Minister and believe it would be completely wrong to have a leadership election now. She is the right person to deliver Brexit and has shown herself to be strong and determined. If MPs with small majorities vote to keep the Prime Minister tonight, they will be voting to secure her in place for the next 12 months, which means she will very likely lead us into the next General Election. Labour will be hoping and praying that we all wimp out. I take it that those cabinet ministers defending the PM this morning, will not put their name in to succeed her if there is a leadership election? I hope colleagues will vote the right way this evening. It is time that we had a new leader to save Brexit, and unite our country. The Country needs a new leader, it is time for Mrs May to resign. Which MPs called for contest?